For Pete's Sake, OCEANFRONT duplex with private Pool shared with the other side of the duplex- Located in a quiet area on the west side and within walking distance to the center of town to restaurants, pier, and amusements. Private beach walkway, decks overlooking shared duplex private pool. Sleep 18 comfortably in this spacious 6 bedroom, 4 bath duplex. Newly renovated kitchen with convection oven and new microwave. Well maintained and lovingly cared for home with new furnishings and details each year to enhance your stay. Plenty of amenities including a well stocked kitchen, dishwasher, microwave, 7 televisions, including one large flat panel "smart" television in the main living space, 3 DVD players, HD DVR on main TV, wireless high speed internet access, ceiling fans in all rooms. 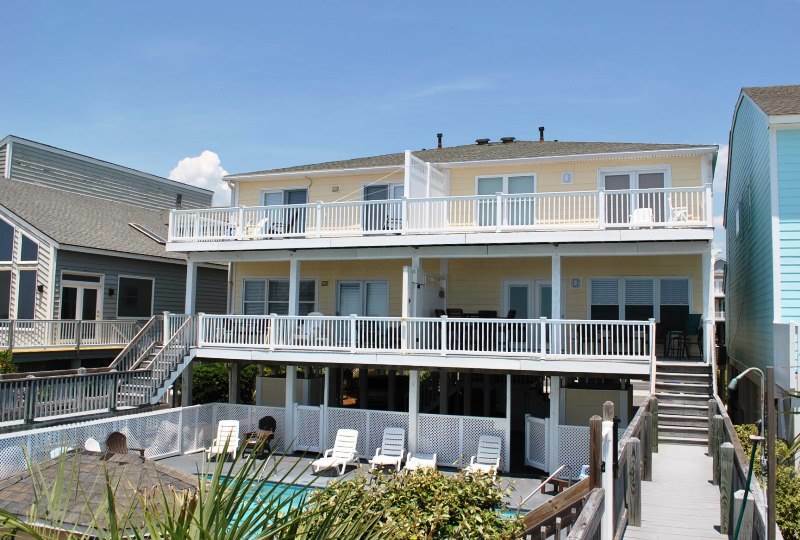 Large sun & covered decks to take advantage of those wonderful oceanfront views, poolside and deck furniture, enclosed hot/cold outside shower and additional shower on the walkway. Non-Smoking! Bedding: Down: King (pillowtop mattress), 2 Queens. Up: King (pillowtop mattress), King, 2 Queens, Queen/Double. Great house. Kitchen stocked well with dishes, pot, pan and utinsels. The ONLY confussing thing are the televisions. There are to many remotes for each tv in the rooms. Takes a little time to figure them out. Other than that great house to rent and good location. The home offer the perfect amount of space and awesome views of the alantic. The decor is dated but fine.